A Visual Guide to Keys and Scales. My violin teacher once said "The hardest part of violin playing is knowing where to put your fingers." I had a very patchy start to connecting music theory with violin playing. Like many amateur players, there were times when the violin was left untouched for work and family. Eventually, I decided to get it all sorted out, but the formal scale books used by examination boards left me cold. Every page looked the same. They explained nothing. What about all the notes below the first note of each scale? There was a gap between the music sheet and the fingerboard. If you know the answers the questions are easy . My first effort was to make a sort of calculator from plastic cards, the sort that came before electronic calculators. You pushed a slider along with a pointer and read the answer. The scale calculator slider had holes with the spacing to match a major scale. The slider also showed in a hole above which key was being used. The plastic was white, so all natural notes showed black from the background pattern. All sharps or flats showed red from the background pattern. A small violin calculator was made first. Then a larger version for guitar followed. ( Photos of guitar version to show here what all that looked like ). But that only showed a fingerboard and fretboard image. 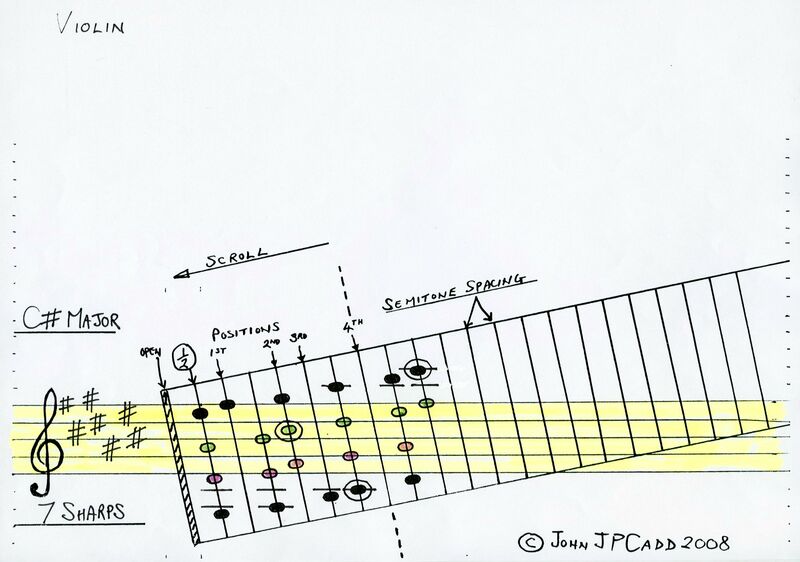 The idea to combine the fingerboard/fretboard and classical music notation, on paper, was next to pop out of my subconscious. None of this was pre-planned. The fretboard image needed to tilt across the music stave. The guitar was my main interest in this. I had just started to learn and wanted access to all the high notes and chords. Lots of experimental geometry followed, until a reasonable compromise was settled on. 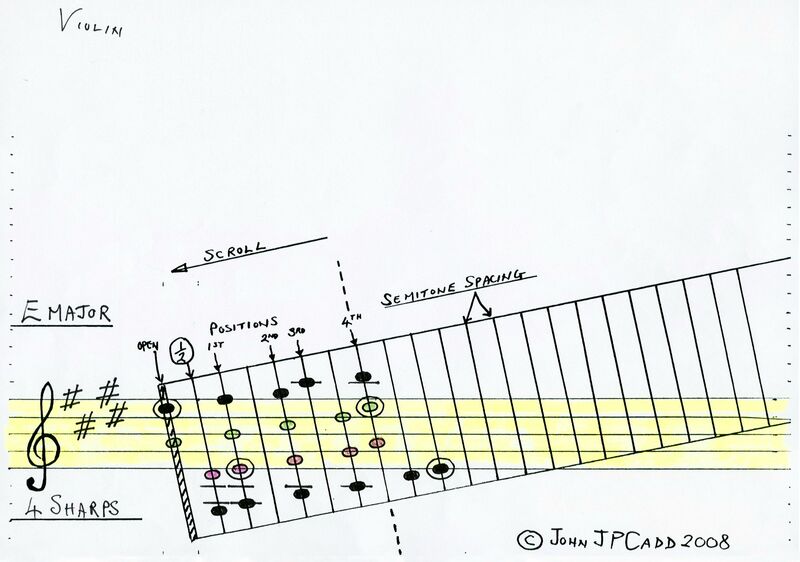 (Even Bach was not too concerned if his bar lines were not exactly vertical!) The note shape was made oval to match the fingertip shape. Each "string " was given a colour, just for clarity. Fourteen sheets (one for each key ) seemed a lot, but only using one at a time was more user friendly than a calculator. The sheets gave the note on the music and the place on the fretboard at the same time -- just like adjusting your eyes for near or far vision. The sheets can be sent by e-mail and printed out, so that was a bonus. The enharmonic keys are much easier to understand. Every major scale note from the lowest open string upwards is included. Keynotes are circled. Each page has the correct key signature. The Bb major top 4 notes should be a semitone higher. My clerical error . Sorry about that . Notice this error was only wrong in the music sense. In the finger position on the string sense it was still ok. This helped me to catch up and organise a large, loosely connected mass of information into a manageable shape. 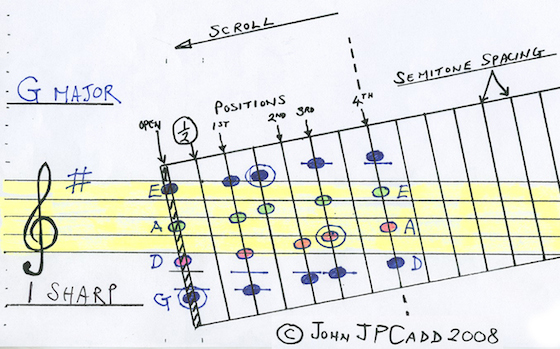 The grid pattern can be adapted for arpeggios, chords etc. As it stands, they just show what notes are contained in each major key. 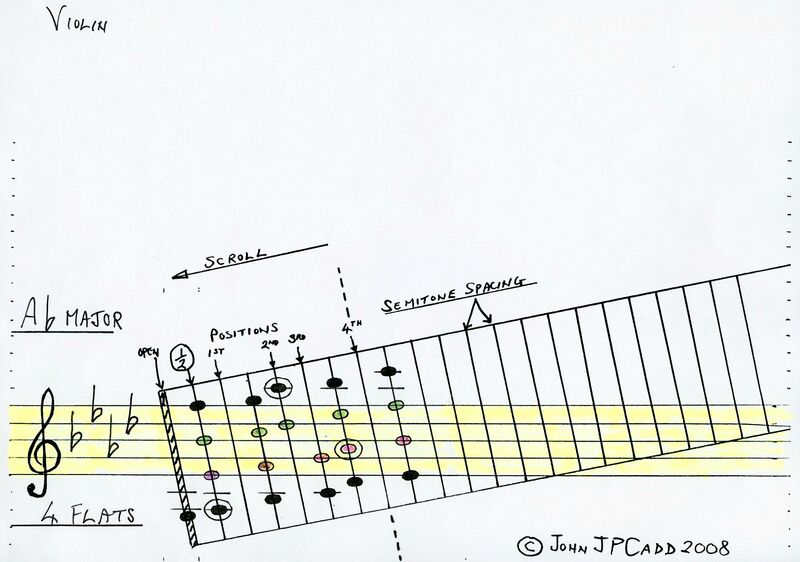 Visual recognition of the patterns across the strings is especially useful. 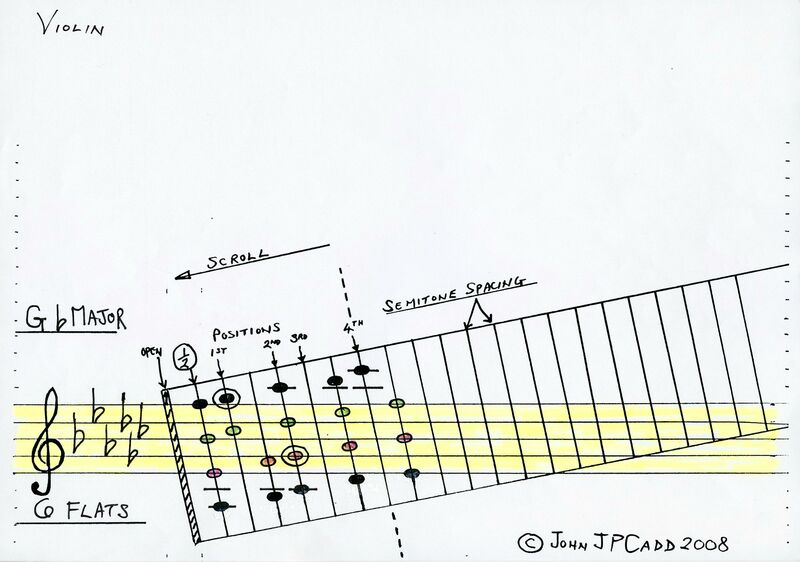 If you look in many guitar books, you find diagrams that resemble radio circuits to explain all this. This is the cure for Tabs. It puts traditional music notation back in the front again where it belongs. Nice job John. It nicely shows the finger patterns. 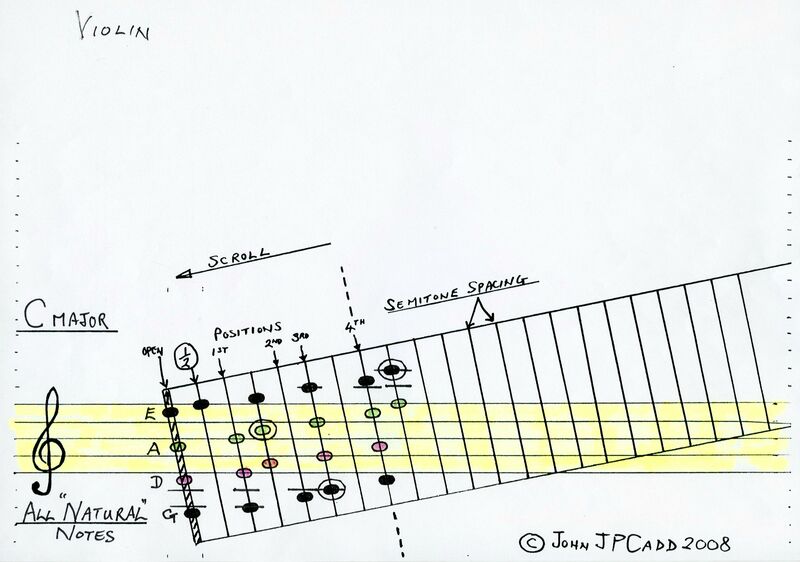 There is something wrong with the B flat major diagram, the notes on the E-string there don't look right to me? I love this idea! Do you have a blank template which could be used for bass clef and cello or bass? Reminds me of the nomographs that were popular with engineers in the slide-rule days. Wouldn't be better and easier to just learn to read notes, key signatures and understand whole steps and half steps? People's minds work in different ways. I found the charts amusing in a weird quasi-mathematical kind of way. John, thanks for the post! Jean well spotted .That was a clerial error on my part. The top line of 4 notes should be one semitone higher. Any notes vertically in line must be a fifth apart. I put them on a disc without noticing. It`s a key often used in church music so they say .I wonder how that could be edited. So what have I done here ? The notes are shifted horizontally to change from semitone to tone. In practise , on an unfamiliar instrument the combination is extremely helpful . I used the system (different sheets ) to learn the guitar and 4 note chords are much easier to identify with one glance . If it emphasises the importance of noticing the key to a beginner that is progress. I hope teachers will test it to see if it works for young players. I think adult learners will like it . I need to help Andrei here . Imagine a learner taxi driver training to learn the streets of London. --The Knowledge --is the name for that . So eventually they have memorised it all . Most people need a map to help them when they have just arrived in London in their own cars . Can you see where I`m coming from ? It`s a bit mathematical like a Tube Train Map. I tried to count how many pieces of information you would need to suddenly understand it all. It came to about 400. It`s a good shortcut which helps avoid mistakes and frustration . I feel this joins up 2 loose ends that should have been joined up many years ago . For Bass Clef and Cello I was assuming the stave lines would be much the same as for the violin . ( edit --pity ---the lowest note lands on a line ) It will not be too awkward to adjust . Keep the angle of the basic fingerboard framework as it is . But start at your lowest open string. 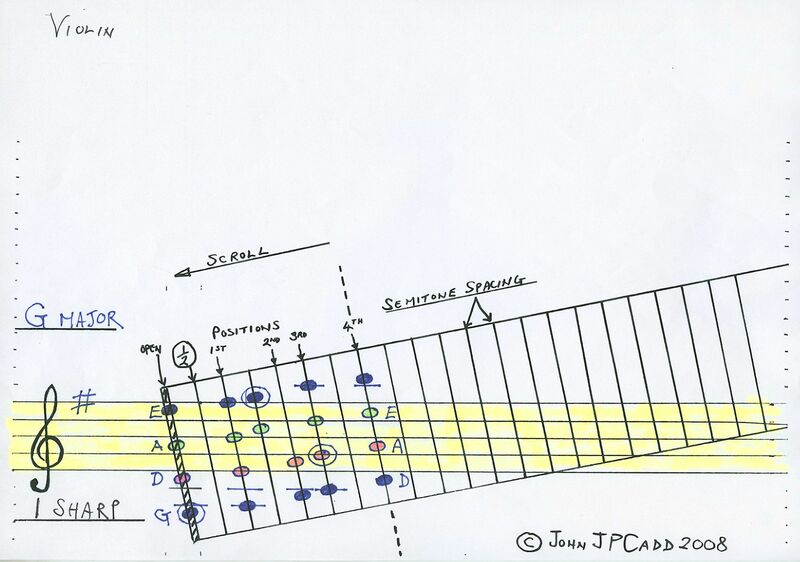 So write the first four open string notes in music position and draw the fingerboard framework from that position. 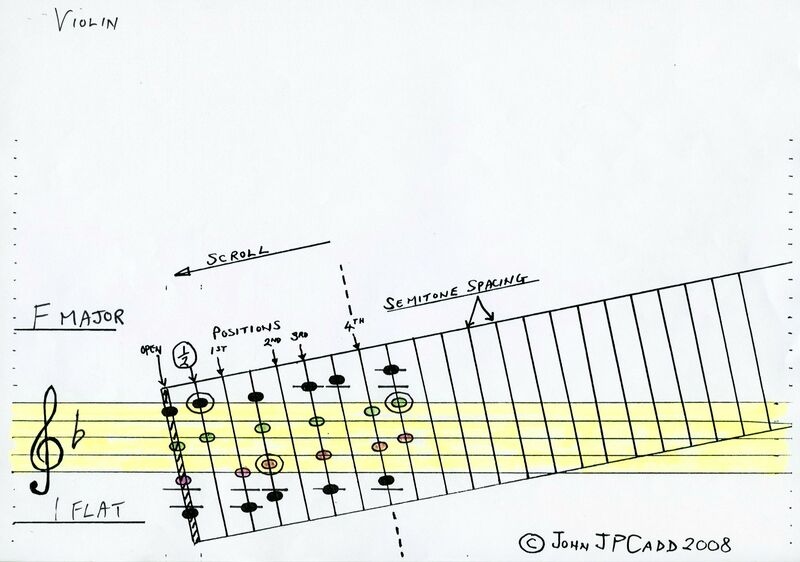 Make a "Ruler " in the form of a scale pattern to check the note/finger positions Spacing tone, tone ,semitone etc . Circle every keynote. Try not to go crosseyed. It takes a lot of attention to avoid mistakes . Keynotes appear along the music lines more than once so make sure they are all circled. Short cut method described below . I checked the Bass Clef and the lowest note lands on the second line below the stave. I had to change the instructions for the Bass Guitar. There are two very important points in this . You need to remember the relative tuning between the strings . The overall pattern of notes formed from the lowest open string will not change. 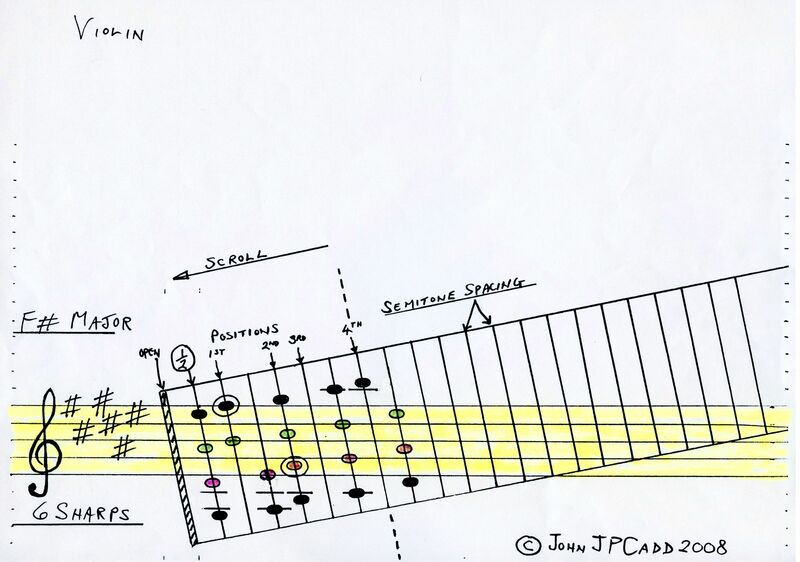 But that whole pattern will move to the right as you move up by a semitone at a time. This is point 2 . 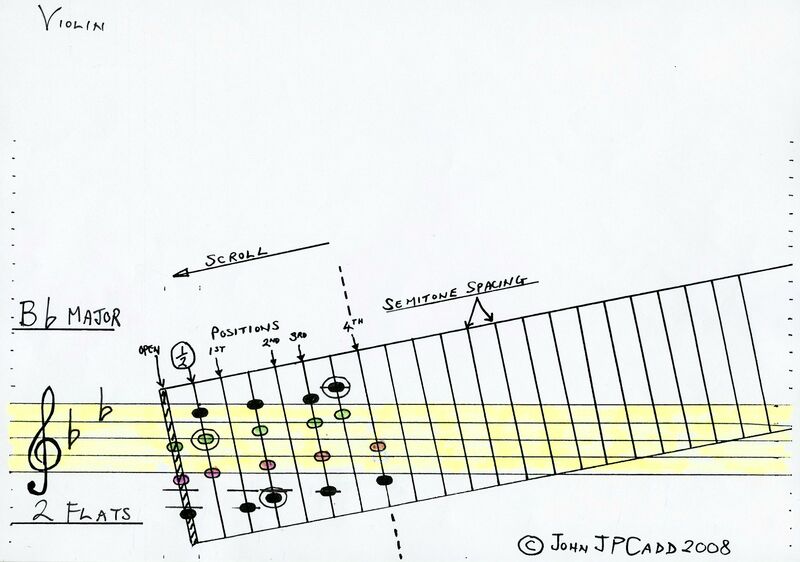 The violin diagram shows each note and fingertip on a vertical line. This is no good for a guitar. The visual effect will be confusing. Start with open string notes to the left of the nut edge. The scales which omit open strings can be a blind spot. Only draw in open string notes if they belong in that scale. 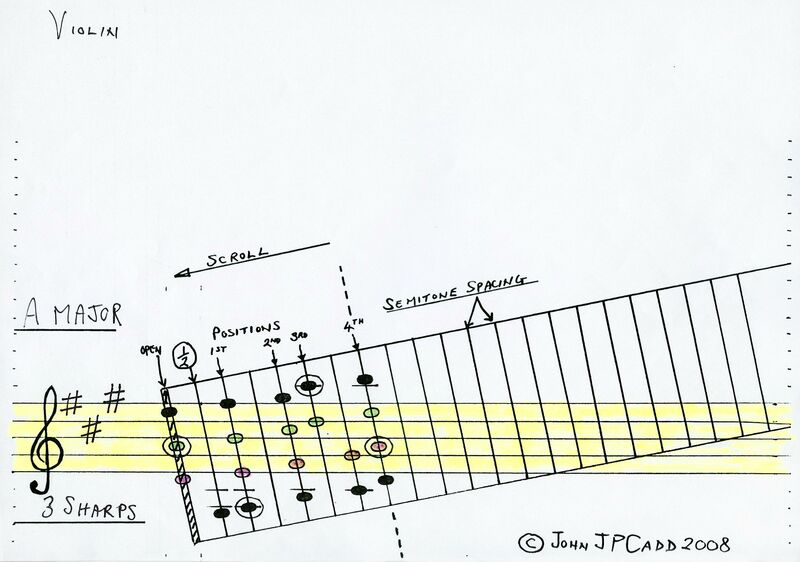 A guitarist plays the notes between the frets.That is the image you need.Then the fret numbering system will appear as normal. So there is not a quick and easy way to transfer from violin to bass guitar .You will understand it better after you work through it all .The unchanging but moving pattern should be remembered. I don`t know the person who wrote the question as he used a number. I hope it works for him/her . 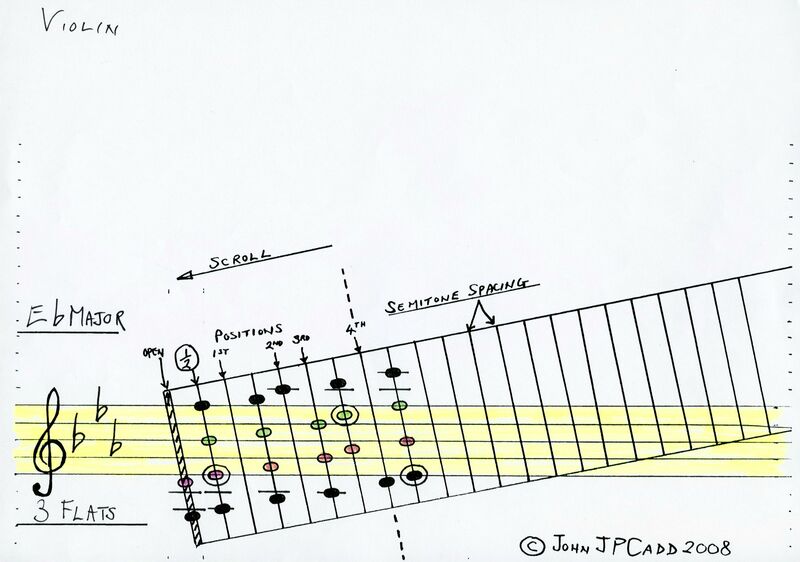 Use a sheet of tracing paper to help with the other scales.A double length octave will make it easier. As you move right the bottom half provides you with the other notes. Andrei Pricope . There is a great deal of this kind of imagery used over the centuries. I`m surprised you have not referred to all that . Tabulature itself has a long history. Wikipedia is a good source to see all that. I only found it myself yesterday . Your students will love my sheets .